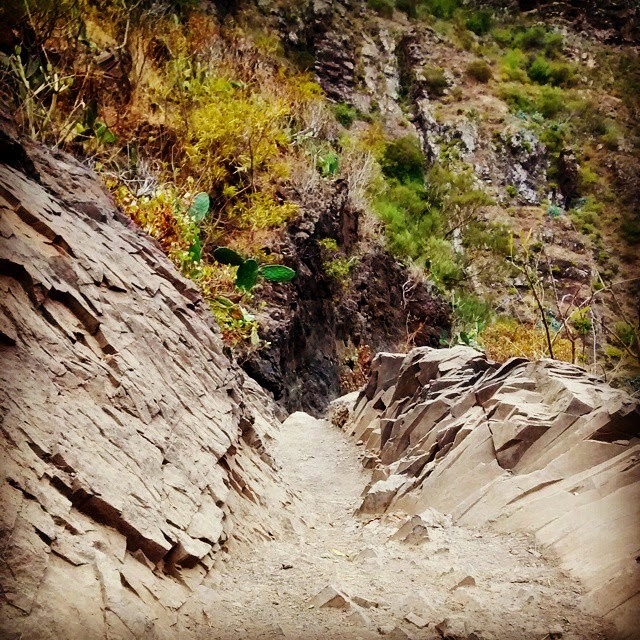 The trail is one of the most popular walking routes on the island and it starts in the unbelievably picturesque village of Masca. Get there early (we’re in Spain, this means before 9.30) to secure a parking space in the small parking area. 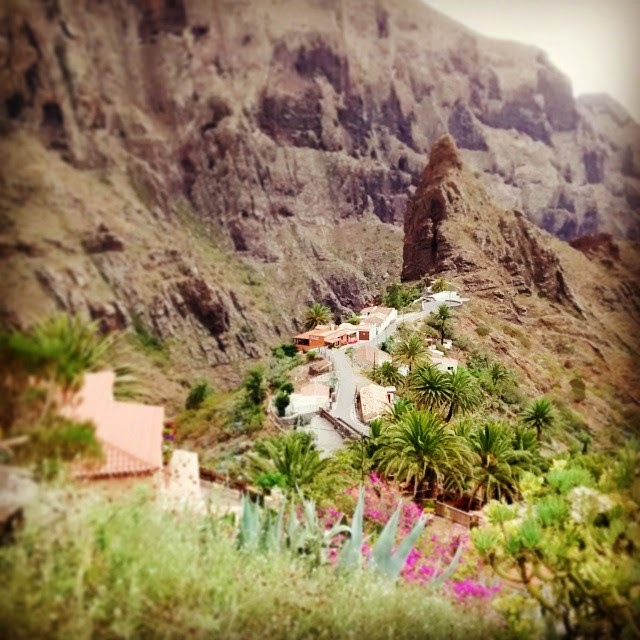 Masca is a tiny little hamlet with just about 100 people living there so finding the start of the walk will not be hard. The day we chose to do this walk was uncharacteristically cloudy so the photos do not bring out the best of the walk but I hope they can give you an idea. 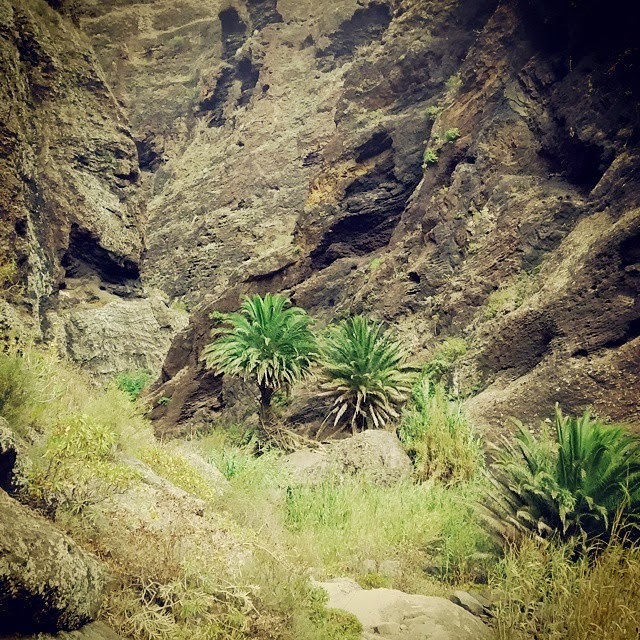 Follow the rest of the hikers down almost the only path that runs through the place and the next thing you know you’re surrounded by 600m volcanic cliff walls, awesome rock formations, palm trees and cacti. As I come from a landlocked country in the middle of Europe and have never seen lava before the experience was just surreal. I kept stopping to take photos of the volcanic rock around me and was delighted in the fact that the shade on the path was provided by giant palm leaves! 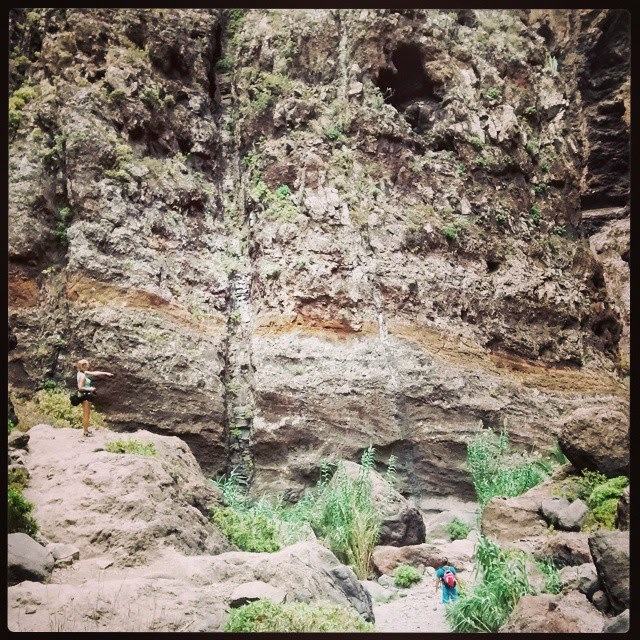 We were in the ‘barranco’ (ravine) in the middle of September and we could only see the remainder of the actual river that carved this huge gorge out of the solidified lava in the form of a few small puddles. 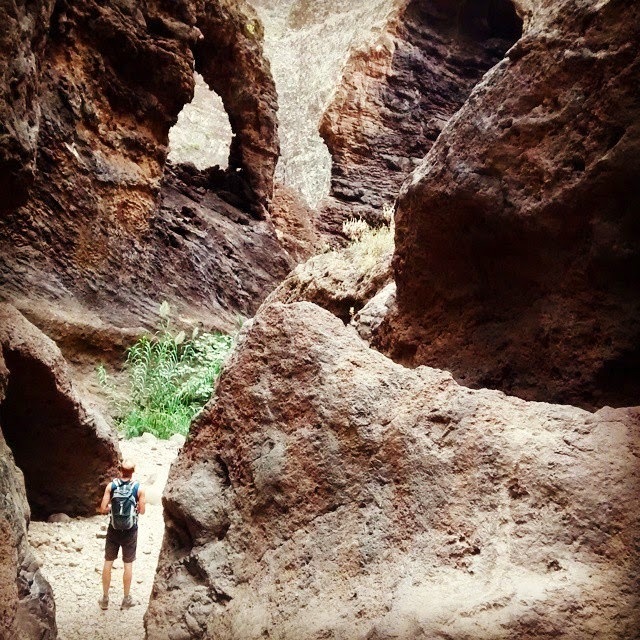 The scenery was constantly changing around us and we could only marvel at the many bizarre shapes. The walk itself is 8km long and we found it quite demanding. You might think that going down is easy however you have to get through a 600m level difference, constantly looking at where you put your feet. In places you can make use of the chains provided however you need to be ready to use your hands, sometimes even your bottom! Do not bring buggies to this trip! It took us 2.5 hours to get down to the sea. We heard the sound of it and Paul could smell it way before we actually saw it. When the cliffs open up you get out to a small area covered with stones. You need to clamber through a section of them to get to the black sand beach. Taking off your shoes and doing the first few steps in the sand will make you feel giddy! Did I say that Playa Benijo is 'as secluded as it gets'? Well, I was wrong! 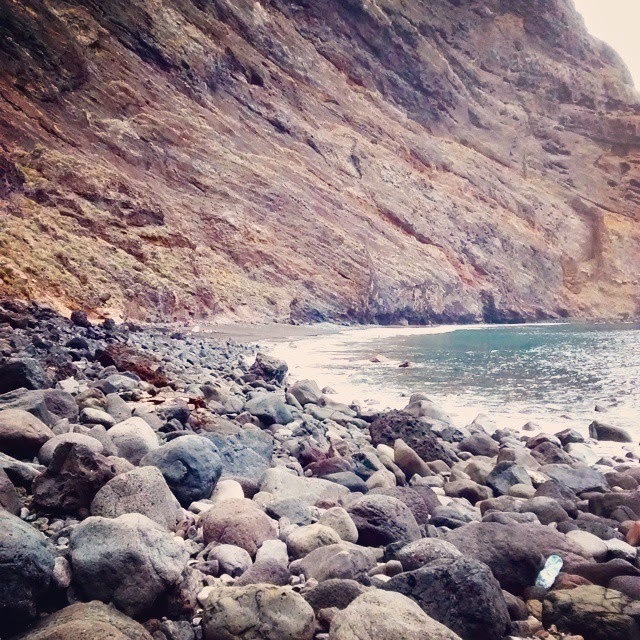 This beach is only accessible via the 2.3-3 hour hike or by boat. This is what I call secluded! 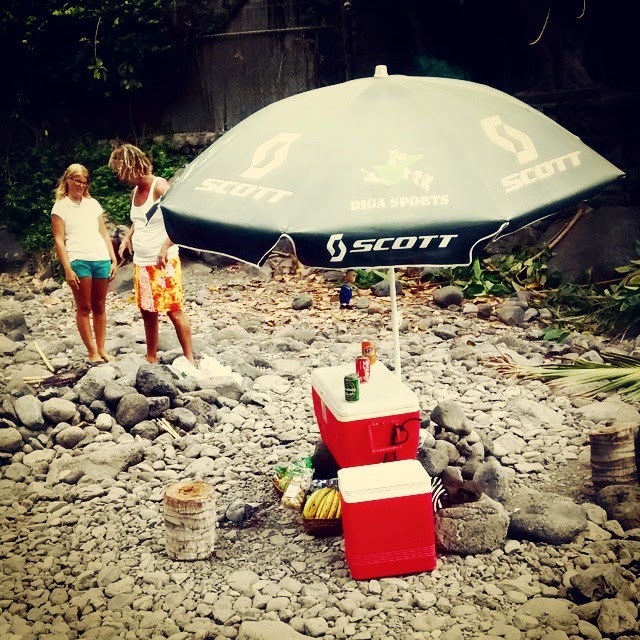 Still, there was a tiny beach bar with barbeque meat cooking on it merrily. We threw our towels down, munched on our sandwich and watched as a Spanish family rolled about in the black sand. We found it very entertaining to watch the tourists stripping down to their swimmers, running into the sea … and running back out squeeling. Nope, the Atlantic does not get warm, people! After our short lunch break we packed up and – much to the other tourists’ surprise – made our way back up. Not surprisingly we made a better time than on the way down, this time we didn’t stop to take photos and we didn’t have to be as careful either. Back in Masca the cold drink that we rewarded ourselves with in one of the restaurants was simply the best! There’s a VERY detailed blog about the walk written by a pair of kiwis, if you feel like you need some more background info, check it out here.